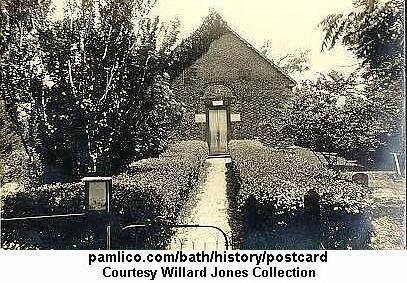 European settlement near the Pamlico River in the 1690's led to the creation of Bath, North Carolina's first town, in 1705. The town's location seemed ideal with easy access to the river and the Atlantic Ocean 50 miles away--at Ocracoke Inlet. The first settlers were French- Protestants from Virginia. Among early English inhabitants were John Lawson, surveyor general of the colony and author of the first history of Carolina (1709), and Christopher Gale, first chief justice of the colony. By 1708, Bath consisted of twelve houses and about 50 people Trade in naval stores, furs, and tobacco was important, and Bath became the first port of entry into North Carolina. In 1707 a grist mill and the colony's first shipyard were established in the town. A library sent to St. Thomas Parish in 1701 became the first public library in the colony. 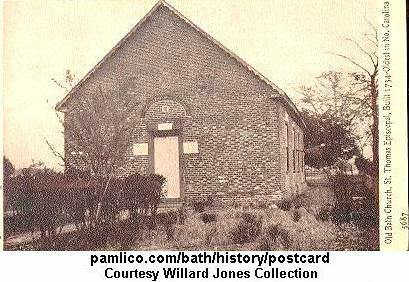 The parish also established a free school for Indians and blacks. Early Bath was disturbed by political rivaries, epidemics, Indian wars, and piracy. Cary's Rebellion (1711) was an armed struggle over religion and politics in the colony. An epidemic of yellow fever and a severe drought occurred in 1711. The Tuscarora War between the weakened settlers and the powerful Tuscarora Indians followed immediately. Bath became a refuge for the surround ing area until the Indian power was broken. Bath was also the haunt of Edward Teach, better known as the pirate ''Blackbeard.'' An expedition of the British Navy killed him in a naval battle near Ocracoke in 1718. 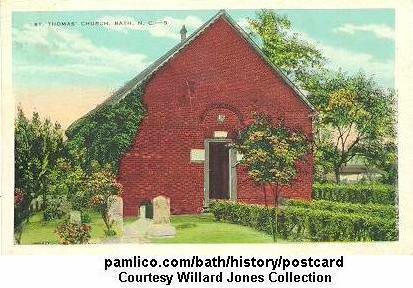 Later Bath offered a more peaceful, settled life. The first Beaufort County courthouse was built in the town in 1723. 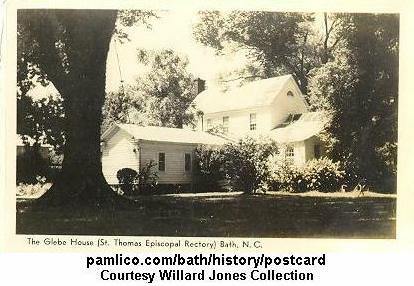 Construction of St. Thomas Church, oldest existing church in the state, began in 1734. 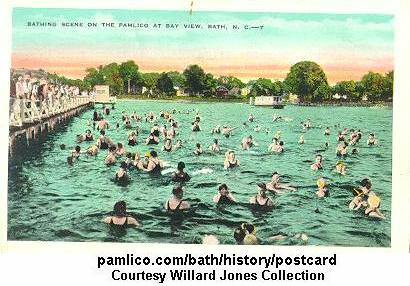 Ferry service was established across the Pamlico River, and a post road linked Bath to New Bern and Edenton. In 1751, Captain Michael Coutanch, a merchant, legislator, and commissioner for Bath and Portsmouth, built the Palmer-Marsh House, Bath's oldest and in the colonial period its largest residence. Col. Robert Palmer, surveyor general, collector for Port Bath, and member of the Governor's Council, later owned the house. The General Assembly met in Bath in 1743, 1744 and 1752. In 1746 the town was considered for capital of the colony. Governors Robert Daniel, Thomas Cary, Charles Eden, and Matthew Rowan made Bath their home for a time, as did Edward Moseley, long time speaker of the assembly. 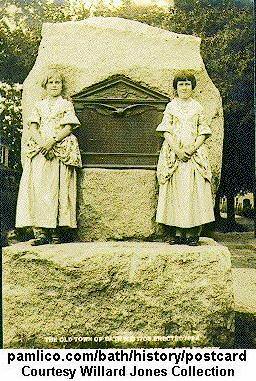 In 1776 a new town, Washington, was formed 15 miles up the Pamlico River. When Beaufort County government moved there in 1785, Bath lost most of its importance and trade. In the early 19th century, the Marsh and Bonner families and Jacob Van Der Veer added to the vitality of the town as merchants, shippers and active citizens. Van Der Veer manufactured rope outside of town and was a partner with Joseph Bonner in an early steam sawmill. Bonner also operated a turpentine distillery. 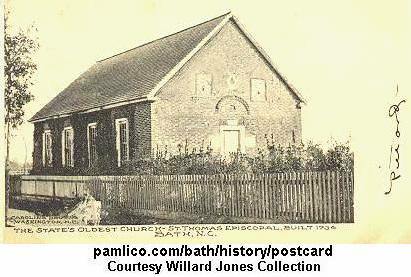 Bath was spared from Union occupation, common in coastal North Carolina, during the Civil War. By the turn of the century, Bath had improved land transportation. Waterborne activities also increased as several large sawmills were operated nearby. Yet Bath remains a small village. Restoration efforts in Bath have saved the St. Thomas Church, the Palmer-Marsh House, the c. 1790 Van Der Veer House, and the c. 1830 Bonner House. The original town limits are the boundaries of a National Register historic district. The Oriental History Museum is one of Oriental's "newest" attractions, and since opening its storefront doors less than a decade ago, the museum has welcomed thousands of visitors in search of an inside-look of Oriental's celebrated maritime history. 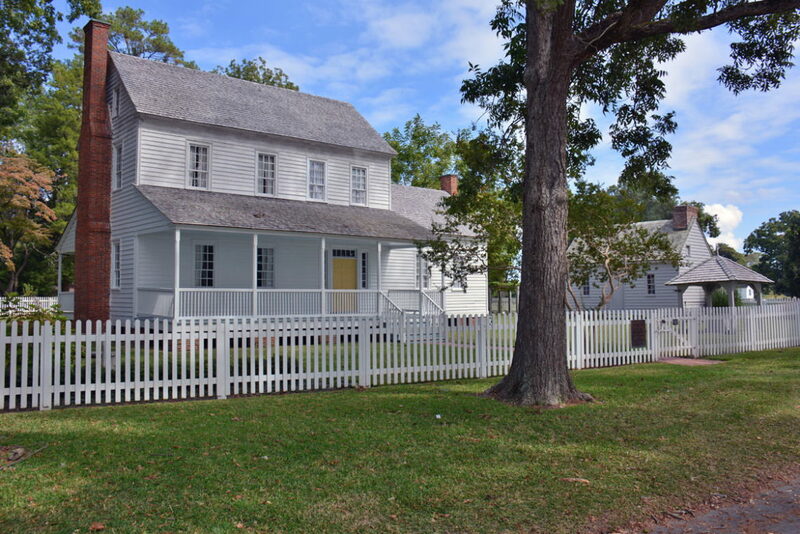 Located in a small brick shopping center, and perfectly in place with its downtown surroundings, a visit to this museum is an easy-going adventure where patrons can take a step back in time, and uncover the everyday household items and local treasures that make this coastal town a genuinely distinctive community. Visitors who want to take in a fantastically performed local show while admiring one of New Bern's many historical gems should make a date to attend a production staged by the New Bern Civic Theatre. With a role of a lifetime as one of Craven County's most distinctive artistic resources, the nearly 50-year-old theater group is overwhelmingly enjoyed by local performers, artists, and patrons alike.